Magazines like Success, Fast Company, Entrepreneur, and Inc. are great and fun to read because they are very informative about what it takes to build a successful business and the only way to do that is by reading about how successful people got there. Everyone enjoys a good rags-to-riches kind of story because it just goes to show that with a little hard work anyone can strike it rich. The reality to that line of reasoning is that it is just not true. Your upbringing, habits, and values you were taught have everything to do with how you approach the world and deal with set backs. In a recent article, Elon Musk’s ex-wife, Justine Musk, talked about what it was like to live with Elon during his start up days when he was just starting out building his billion dollar companies we know him for today. The article is very insightful but there is so much to take apart from reading it because many will walk away thinking that hard-work is all they need to do to be successful and rich like him. That is the wrong message to pick up on yet so many fall for it. This article will explain to you why the Steve Jobs, and the Bills Gates, and the Richard Bransons’ of the world are super rich and why money was never their original goal and why people like that are so different from everyone else and why it all matters. There is a lot to say about the upbringing of successful people. Many of the them dealt with hardships that made them realize how much harder they had to work to become successful while many others had the options provided to them but the setbacks told them they weren’t trying hard enough. Howard Hughes was one such child who took many of his ideas and turned them into a reality. In the Houston area he was one of the first kids to ever invent a motorized bicycle. His sheer curiosity led him to taking apart a steam engine that his father had and using the parts to build the motor on the bike. He was the talk of the town and got his picture taken in the local paper, which was considered a very big deal back then. Howard Hughes was a dreamer and a doer, anything he set his mind to he was able to create it for himself. The money his family had, after his father invented a drill bit that would forever change how drilling was done, enabled Howard to go on and create a vast fortune, the likes of which had never been seen before. Howard was never restricted in his pursuits and interests. Anytime he was interested in something he would find as many books as he could find on the subject and read until he knew everything he could on the subject. This intense drive would later lead him to having his first flying lessons at age 14 and later taking random engineering and math courses at Caltech. This was the same habit that Steve Jobs would later do at Stanford, except Jobs didn’t limit himself to just those areas of study but opened himself to everything Stanford had to offer, which he took full advantage of. Children need an upbringing that exposes them to different ideas and ways of living in order to see how this world actually works. This gives their mind ideas and then their mind comes back with solutions to some of those problems and fills in the gaps. The doers go out and start finding ways to make it all happen. The dreamers continue talking about the problem and wait for an excuse to not do it because someone else already is. The worst action a parent can take for their child is to keep them so busy with pointless activities that the child is too tired to ever stop for a minute to understand why they are having to do all the stuff their parents are making them do. These are the kids that miss out on things that other kids get to do but they don’t. These kids grow up believing that they are supposed to be attending sports practice and games every weekend and taking school classes to improve their grades while other kids get to be apart of programs that they are purely interested in doing out of sheer curiosity. Which child will have a better outlook on life in the end? The child with the parents who lets the child decide what they want to do with their time and what programs they get to join, that’s who. Do understand though that not every child has an inner drive and, so again, that is where the Steve Jobs and Bill Gates of the world differ from everyone else. Steve and Bill had intense passion in them to learn and do things that interested them so they didn’t need parents to keep them busy because they were already doing that on their own. Richard Branson is dyslexic and did poorly in school growing up. Today he probably would have been medicated and placed into remedial programs because he was always causing a fuss in the classrooms and instead of the teachers knowing how to deal with him properly, the school would have made the parents medicate him in order to control him. The future of Virgin empire would not exist today if that had happened because people who don’t have larger-than-life personalities don’t amount to much in life. Mr. Branson is a larger than life person because of the extreme activities he has taken to get his business known to people. Most people play it safe in life because it gets them from point A to point B very easily. People like Gates, Branson, Musk, and Zuckerberg risk a lot just for a small gain of control but it is that control that sets them apart from everyone else. Branson is known for his media attention stunts, most of what most people would never do because the risk is too high but people like Branson don’t see it as that, they see it as living life to its fullest and enjoying what comes with it, even if it’s nothing. Michael Jackson grew up with a very hard father who made his sons practice everyday until they got each song correct. Michael was 5 years old when he was already performing as the lead singer for the Jackson 5 band. How many 5 year olds do you know who can sing, dance, and perform for people professionally? Very few but they are out there. So why did Michael rise to heights that no one else on earth has ever achieved before while so many still struggle to get there now that the internet has made it easier to achieve attention and fame? Michael’s father instilled in him the lessons of hard tedious work habits. His father made him practice when he got home from school until it was time for bed. Then he had his boys perform at any nightclub or bar that would let them perform to start improving their stage presence. It wasn’t too long before the boys got so good that everyone was in sync and no mistakes were made because if there was the boys would get a beating from their dad. (Aside note: no form of abuse should go that far with instilling valid discipline skills in someone). In many interviews Michael talked about how hard their dad made them work and that is why he would spend hours in the studios working on songs and practicing his dance moves. Everyone who has ever worked with Michael will tell you that he was a very hard worker and he wouldn’t stop working until everything was perfect. Bill Gate’s childhood is interesting because when he was first introduced to computers he had all the time in the world to learn everything about them because he was still just a kid. He didn’t have the responsibilities that pull adults away from learning things to improve their lives so he was able to put in a large amount of time before he ever stepped foot on Harvard campus, enough to make him an expert. 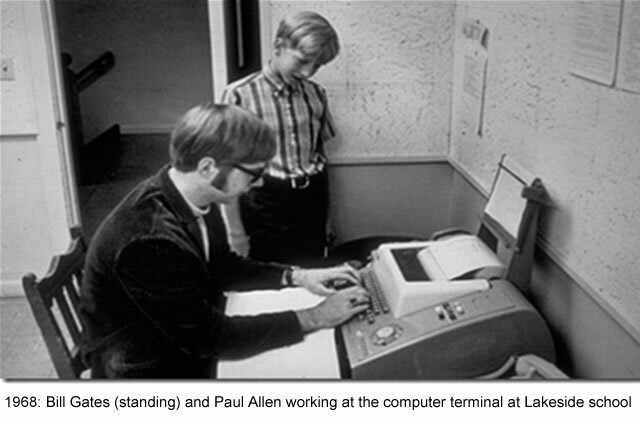 By the time he got to college he had already created several programs, which he created by studying how lines of code work, all on his own. The freedom he had growing up and the intense push by his parents to always win and excel at sometime gave him the inner fire he needed to become a fierce business man later on. Michael Jackson and Howard Hughes are perfect examples of people with larger-than-life personalities. People like that can walk into a room and everyone looks at them because of the sheer intensity of their personality. Their personalities act as a magnet, attracting everyone around them to come and talk to them because they act so fascinating. Their lifestyles were so out of this world that it made them seem more than human. Michael Jackson created the allure of what it meant to be rich and famous when he purchased Neverland Ranch in the 1980s. No one had ever done such a thing so he created this whole sense of being above everyone else just by how he lived and even by how he dressed. He never wore simple things, they were always clothes with style and color to them that only someone of royalty would wear. Moguls are people who have created their whole empire around who they are by what they do in their life. These are people who can walk in a room and seem totally crazy and insane to everyone they meet and talk to but the reality though is that they know exactly how to make what they say happen. This is what sets them apart from so many people – how they execute their plan. That they are able to follow through on their word, regardless of the risks, and make all of it come true. Of course there are those that failed but they took those failures and made something out of them. They turned them into valuable lessons that few ever stop to consider. Most regular everyday people will stop when someone tells them to because they are afraid of breaking the rules or getting on someone’s bad side. A mogul will not take no for an answer but instead will ask questions and find the loopholes to what it is they want to accomplish and if they do not get the answer they want to hear then they try another way or talk to someone else that can help them. In the movie, “Revenge of the Electric Car,” Elon Musk took full responsibility for all the problems Tesla had in the beginning. They were not able to make their delivery date and so the first group of people were very mad because not only were they not able to get the car they order on time but they were also being asked to pay more because of Tesla’s mistakes. In order to handle this problem personally, Elon Musk sat down and talked with these people and answered all their questions about what went wrong. He made it a point to be there in front of them and show them that he cared very much about what he was doing and that he wanted to make sure they heard from him personally about the struggles and you know what? Everyone listened and empathized with what he had to say but not only that but also what he was going through. His company was burning through cash at a fast pace and no one knew what would happen after these car buyers got the cars they ordered. The very fact though of being present in front of them was enough for them to realize that he really did care about his company. He knew he couldn’t just send them an email and be done with it because they might be the make-or-break point that his company needed to get off the ground. Of course, today Tesla car company is ahead of so many others in creating luxury electric cars. The fact that he spent many nights not knowing if his company would live to see another day is what separates people like Musk from everyone else. They have the tenacity and vision and strength to push through and talk to people. It is their inner drive and people skills that sets them apart. Majority of people would have tanked under all that pressure Elon had in the beginning days. Stress is an everyday part of our lives and it comes in various forms but it also depends on the lifestyle you live that will determine how much stress you bring into your life. Some people bring stress onto themselves just by how they think and others can keep stress at bay because they are very efficient in handling their tasks. How you handle stress though is a trait of your overall personality. People who are very successful never let stress get in the way of what it is they are doing. They don’t make excuses for it and they never let repetitive tasks stop them. They push ahead to create something so they can see that progress is being made. They pace late at night thinking about how to execute everything correctly. They manage the stress by keeping themselves focused on what they need to do instead of letting it overwhelm them. It was common to hear from friends of Michael Jackson say that he would call them late at night, usually around 3 or 4 in the morning because he had an idea that he wanted to share and go over with, so people with intense personalities are always working and thinking about how to make something better. People like Elon Musk, Richard Branson, Mark Zuckerberg and Bill Gates are always flying all over the world to speak at events, attend meetings, talk at conferences, and lots more. This requires a lot of traveling, a lot of time away from their family and partner, but most importantly it puts a lot of mental and physical stress on their body. People like this are told they have to stay inshape in order for their body to handle what they do all the time. When Bill Gates discovered the lectures, “Big History,” which is a program created by the Teaching Company, “Great Courses” series, he was actually working out in his private gym he has in his home. He makes it a point to watch lectures while he works out for an hour, why? Because he understands that he needs to keep his body in shape for all the work he does everyday. He also watches these lectures because he knows how important it is to always be learning. Now that he discovered that history program he is working to make that a part of the regular curriculum children learn in school. This is also another key characteristic that sets moguls apart from everyone else. They see learning and reading as an integral part of their life that they make it a point to read and study everyday. They view the public library as one of the most important contributions to human life. Most richer than rich people are self-educated and for very good reasons. They knew exactly what it is they wanted to learn about the world in order to make what they wanted happen. They didn’t need a piece of paper in high school or college to motivate them to learn and study, it was their personal projects they were working on that made them want to learn. A degree in college was nothing to them if it meant getting in the way of their learning. The famous phrase from Mark Twain is one that many moguls live by, whether they know it or not, “I have never let my schooling interfere with my education.” Do you think Facebook would be around if Mark Zuckerberg did as he was supposed to and attend classes and study and do homework? No, that would have taken time away from him working on building Facebook. He was so focused on building his product that everything else started to just fall away. The same for Gates, he was too busy working on creating Microsoft to worry about attending lectures and doing homework that he just dropped out and went on to become the richest man in the world. This was only because he knew what kind of education he wanted and needed to do the things he wanted to in life. Growing up he spent many hours in the public library reading and would even give himself goals of reading a lot of books during the summers. The public library to many of these greats is that you can get an entire education for free just by going in and sitting down and reading. There is no cost to just grabbing a book that interests you and learning everything you want on the subject and that is how they these greats lived their lives. They would spend hours upon hours reading up on subjects that fascinated them until they were the experts on the subject. It was their fierce drive and personal interest that taught them the importance of learning. They didn’t need a bachelor’s degree or masters degree to tell them they needed to study and work hard on something, they already had the self-motivation to do it on their own; all for the price of nothing but time. To moguls, time is a very precious resource and they know that reading is perhaps the most important task, aside from working on their ideas, they should be doing anytime they get the chance. When someone like Branson or Musk read, the read, not because they are told they need too but because they are very interested in the subject matter and that is why everything they read is interesting and not boring. Here’s a joke – what place has more wealth than a bank and never gets robbed? A library. You will get no where if you do not have something that drives you everyday. Thing that drives you has to be so big that it pushes you to get other people involved and that obsession carries over by how you are able to convince people of why they should be involved as well. Steve Jobs spoke with conviction because he believed that everything he was working on was super important so it made people listen to him. There are a number of books on him now that explain how to talk and present like Steve Jobs. Your obsession must be so intense that it pushes out the mundane in your life and gets you to focus on what you need to work on. Infact, this obsession will sometimes cause you to forget to eat, sleep, and tend to the tasks you need to be doing that are just apart of life, like showering and maintaining a regular sleep schedule. This is hard for people who have projects so large in their life that they know that for every minute spent doing something else their project falls behind. The reason why people like this create such a high level of obsession is because they are so fascinated by the work they are doing that they don’t want to stop. Right now there are thousands of teams coming together to create apps and companies so they can capitalize on a problem in the market. The only problem with many of these thousands of apps is that they will only solve a small problem and only for a sort period of time because the life of an app now is very short lived. Only a small group of apps get to live longer than 5 years before a new one comes in to replace it. Remember teens are very finicky about what is on their phones and they are the ones to help bring about trends. People like Gates, Jobs, and Musk are all working on problems that are much larger in scope. They work to fix major problems in the world so that millions, if not billions, are improved by the work that they do. One has to have an intense and obsessive personality in order to handle all that pressure from people who want to speak with you all the time. The personalities of people like this are extreme. They are autistic, dyslexic, have ADD, or that one kid who just didn’t fit in with everyone else. If they are not medicated but encouraged they will go on to do great things with their time and life. Intense personalities are not sedated they are allowed to flourish. The people around them might get annoyed but that is their problem because the people they will attract later on will be the ones to help them with their ideas. Steve Jobs became Steve Jobs because he didn’t fit into any mold that society had for him, he probably made a lot of people mad and annoyed a lot more. This is what people like the greats do, they piss people off because not everyone can handle their intense passion and creativity all the time so they are prone to have fewer friends but more people interested in working with them. They are not concerned if they annoy anyone because they don’t expect everyone to understand what it is they are trying to do until they can prove what it is afterwards. Then, and only then, do people finally come to see what geniuses they really are. The great minds of people are careful how they spend their time because they realize that time is money and how they spend it will determine if they gain anything from it in the end. If they don’t then they know it was not time well spent. This is how they view it, even in the beginning days before they are rich and famous. Remember money for them is never the goal. They look at projects, books, websites, as something they can take away that will help them later on. You will never see people like this playing apps that will take their time away but instead talking with people that will only further their cause or reading books that might give them insight as to how to look at a problem. Justine goes on to say that the greats of today studied the greats of the past and this is very true because history has taught us that we are creates of habit and history repeats itself because of that very habit. The tools we use today are different from back then but our relationships to one another have not changed and how we use those relationships is to anyone’s advantage who knows what to study from people of power a lot time ago. Biographies tend to be popular books because they provide insight to their life and times of long ago. If you want to be like one of the greats start looking at how you spend your days. Do you have your schedule laid out before you, do you have projects that you complete when you say you will or do they always get pushed back? You have to look at how your life is spent because people of influence and power are always in control of their life and schedule which is what amounts to success. If you make excuses to get out of events you are supposed to be at then what does that say about how you prioritize your life and time? The world caught notice of her great response to the question, “How can I be as great as Bill Gates, Steve Jobs, Elon Musk, Richard Branson?,” and what made it even better was that she commented on whether or not Elon Muck contacted her after she wrote that and she said that he did, only to say, “Well said.” The lessons she has learned, from living with a man who is doing so much in this world, will forever change how she approaches life, work, and sets goals. For one who still thinks it is about only hard work, you now know that what you read and spend your off time doing is just as important as the work you put out. Also the people you surround yourself with and what they do with their time is just as important as when you consider what to watch or read. If you read amazing content your goals and work habits will start to reflect that. If your friends are successful then you know that success breeds success. For anyone that wishes to achieve such heights it is a very lonely journey to the top with very few friends waiting for you at the end. If that is your goal then good luck and keep a healthy lifestyle because you will need it. This entry was posted in Business and tagged alpha masters, big history David Christian, childhood of howard hughes, creating innovators, creating minds, Elon musk, entrepreneurs, geniuses, great courses, how to be a genius, how to be an amazing person, how to be like bill gates, how to be like elon musk, how to be like mark zuckerberg, how to be like steve jobs, how to be successful, how to get rich, howard gardner, howard hughes, michael jackson, secrets of successful people, sparks of genius, superstar michael jackson, the creative brain, the genius of elon musk, uncommon genius, Walt Disney, what does it take to be like bill gates, what does it take to be like steve jobs, what is success, what it takes to be wildly successful, what makes successful people so successful on May 1, 2015 by Chris.